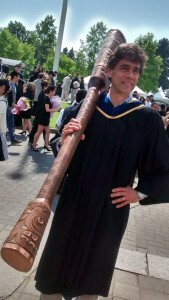 As we count down to May graduation, can we please remove the mace from convocation and governance at the University of British Columbia? The mace had its day in the first 100 years of this esteemed University but that day has gone. Times have changed, business as usual has been called into question and the Board of Governors is currently operating under the pall of a No Confidence vote cast by faculty members. The days of the mace in Convocation and governance are of the past and that part of the past is no longer worth reenacting. It has been an emotional year for UBC. As we launched the celebration of our Centennial at UBC 100, our President resigned under a cloak of secrecy. As we began to party, we launched an investigation to discover the lengths to which a Chair of the Board of Governors and administrators might go to suppress academic freedom. As no accountability was forthcoming, a No Confidence vote was cast. As the BoG continued with business as usual, staff and students expressed serious concerns to triangulate those of faculty members. It is time to retire the mace, symbol of aggression, authority, and war. It’s time to march to graduation ceremonies in late May with open and empty hands as symbolic of peace and reconciliation of controversies and roles of the President’s Office. Remember, since that fateful November day in 1997, just five months into Martha Piper’s Presidency, when student activists put their bodies and minds on the line at the APEC protest, Tuum Est adorns both the can of mace sprayed in their eyes and the ceremonial mace that the President’s Office is eager to carry across campus every November and May. Is it not time to retire the mace?